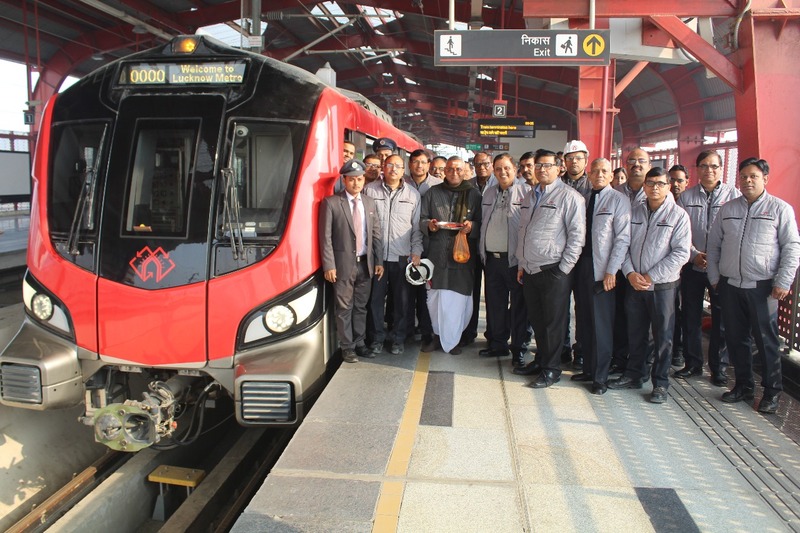 Lucknow Metro Rail Corporation (LMRC), today successfully commenced the signaling & integrated testing trials by moving the Metro train between Transport Nagar Metro station and Chaudhary Charan Singh Metro station. With this milestone, Lucknow Metro is now inching closer towards commissioning of the whole 22.878 km long North-South Corridor (Phase 1A) from CCS Airport to Munshipulia. The integrated testing and trials are for smooth operation of the trains having an interface with signaling, telecommunication, track and traction. The trains have been provided with the latest state-of-the-art Communication-Based Train Control System (CBTC) Signalling system with Automatic Train Protection (ATP) for automatic braking to prevent any collision. The Automatic Train Supervision (ATS) system has been provided to ensure automatic management of train movement by Automatic Route Setting and Automatic Train Regulation by supervising the train movement continuously and optimizing the train movements in case of abnormalities. This integrated signaling trial will also test for the Automatic Train Protection (ATP) and other aspects of Communication Based Train Control System (CBTC). The signaling testing is also being verified and validated by an international Independent Safety Assessor (ISA). Earlier Track and traction team completed their work in record time. The underground section and tunnel section in Lucknow Metro has been provided with Rigid Overhead equipment for current collection to run the trains. A state of the art rigid OHE structure has been provided at a diamond crossing for the first time in Lucknow Metro near CCS Airport Station to move the trains from one line to another line which is available only in few of Metro worldwide.